Does the Worship market really only want to run at standard definition? Now that computers are increasingly the primary video source, why do mixers still look like they’re designed for connecting VHS tape decks – especially when you’re shelling out thousands of dollars for the hardware? Let me get something straight. I love Roland, on both the audio and video side. The V4 video mixer remains one of the great workhorses of all time. Roland and Edirol’s gear sometimes may cause sticker shock, particularly among more casual users, but it can also be extremely reliable and intuitive to use. I also love standard definition video. 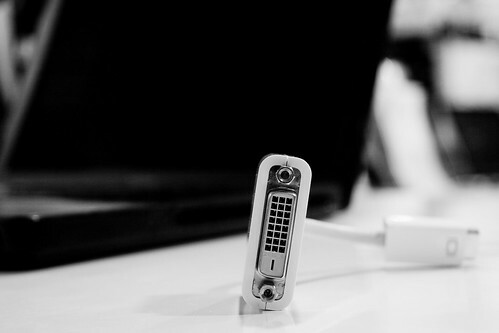 There are many cases in which I think HDMI, for instance, is the wrong tool. 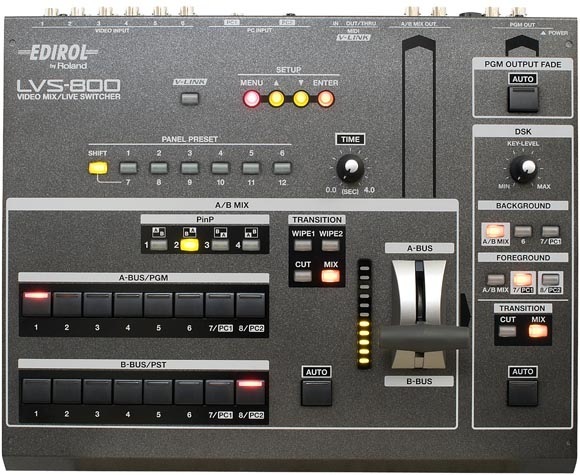 And I’m sure the LVS-800 is the perfect gear for someone out there. I also expect Roland knows their existing customer base much better than I do. But then there’s the rest of the potential user base. It’s impossible to ignore the painful absence of any gear that makes it easy to mix two computer signals together at their native resolutions. It’s such a ubiquitous need, in fact, that it’s hard to even describe the usage scenario. The potential target base is, basically, everyone on Earth working with live video video or visuals or computers, from churches to clubs to the arts. Heck, watching people struggling to swap input signals on a projector in a presentation is argument enough, so count conference centers in that list, too. That’s before you take into consideration HDMI output from increasing numbers of cameras and video sources. 1. Edirol, makers of the massively-successful V4 and the king of selling video equipment to the worship market, would be a logical choice to make an affordable product for computer mixing, but they still don’t. 2. The LVS-800 makes the use of PC/Mac video sources a selling point, and has two VGA inputs for mixing on the back – which it then converts to standard resolution and outputs as composite video. Whatever technical reasons for doing that, it’s the opposite of what a lot of their users want. 3. It’s the year 2009, not 1999 or 1989. One (output) is the loneliest number. Photo (CC) Francis Bourgouin. Now, don’t get me wrong – as a simple video mixer, the LVS-800 looks lovely, so long as standard definition is what you’re using. You’ll pay for that functionality, with a US$3795 list price. But once you do, you can connect up to eight video sources, for cameras, samplers, and (via the two VGA ins) computers. You also get multiple outputs, with separate A/B mix and Program Disk. You can use the LVS-800 as a switcher or a mixer, or both, with A/B mixing and various fades. There’s also a fade-to-black and fade-to-white, plus a simple, powerful keyer (“Downstream Keyer: Composition Function” or DSK in Roland-speak). Of course, at this price, you should also consider the “boutique” Vixid video mixer, the applications of which our own Jaymis has been blogging for a number of months. The VJX16-4 has 16 inputs, 6 outputs, A/V sync, more interesting effects and blend modes, allows compositing of four sources (A+B+C+D to the Edirol’s A+B) with four faders to match, richer MIDI control, image correction, and more preset storage. In fact, even at EUR2990, I’d really have to recommend the Vixid over the Edirol. The Edirol has VGA inputs, it’s true, but since it doesn’t mix or output in VGA, that doesn’t really help you. The Vixid is far more interesting for blending and effects, and you get what amounts to a video matrix and 4-channel mixer/blender compared to what from Edirol is really just a switcher and 2-channel mixer. Sure, the Vixid works out to more cash ($4374 US, currently), but you get a lot more in return. If you only want two-channel mixing, then the Edirol still makes some sense – and you save a little bit of cash – but erring on the side of flexibility is usually a good idea. A built-in scan converter converts the incoming RGB signal to a standard definition video signal. Channels 7 and 8 can be used for both computer and S-Video input. When both types of signals are input, the S-Video takes priority. That’s not to say Edirol doesn’t face some challenges. The architecture of existing mixers is able to do all these fancy tricks, but not to handle higher-resolution computer inputs. And Edirol is largely alone when it comes to hardware mere mortals can afford – for now, at least. But I have to make a plea: I’d love to see Roland stay in the video game. The company has, historically, embraced (and invented) the future on a number of occasions. It’s just hard to believe Roland couldn’t find a way to make a simple 2-channel VGA mixer. If they don’t, eventually someone will.